Trigger finger, or stenosing tenosynovitis, is caused by a narrowing of the sheath that surrounds the tendon in the affected finger. The symptoms of this condition include finger stiffness, popping or clicking when you move your finger, tenderness or pain in the affected knuckle and the affected finger catching or locking in a bent position. There are several treatment options for trigger finger including rest, splinting, medication and massage. The Mayo Clinic notes that gentle exercises may help maintain mobility in your finger. Consult your health care provider before beginning a new exercise program. Massaging the affected knuckle will facilitate blood flow to the area, which will lubricate the joint and prepare it for movement. With your affected finger in a comfortable position, begin to gently rub across the knuckle then rub in a circular motion. Continue the self-massage for two to three minutes and follow with range-of-motion exercises. 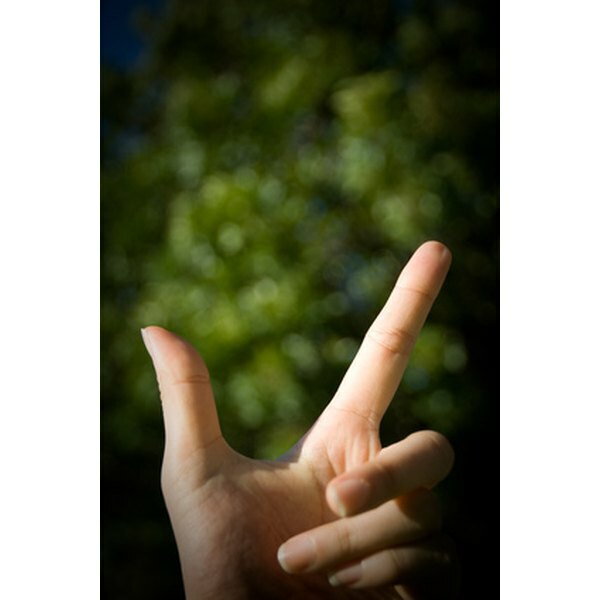 Assisted movement exercises will help maintain and even improve range of motion in your affected finger. Use your other hand to slowly and gently bend and straighten your affected finger, moving it through the largest range of motion possible. Bend and straighten your finger 10 to 15 times. Stretching your finger is important not only for your muscles but also for the tendons and ligaments in your affected finger. Keeping the connective tissue as flexible as possible is important in the treatment of trigger finger. Use your other hand to pull your affected finger beyond extension until you feel a stretch in the bottom of your finger. Hold the stretch for five to 10 seconds then stretch your finger in the other direction. Repeat each stretch three to five times. Trigger finger is common among individuals who repetitively grip objects. Gripping is performed by your flexor muscles, which means your extensor muscles may be weak causing a muscle imbalance. Strengthening these muscles may help in the treatment of trigger finger. Keeping your fingers straight, bend your knuckles so that your hand forms a 90-degree angle. Press your thumb close to your fingers then wrap a thick rubber band around your fingers and thumb. Working against the resistance of the rubber band, open your hand by extending your fingers as much as possible. Slowly return to the starting position. Repeat the exercise 10 to 15 times.